⬅ Have A Nice Day!!! A web browser in modern computing is an indispensable piece of software, considering all the functionality have been performing in our day-to-day work. Think about it. We use our browser to find information, to check out our email, to connect and communicate with other people, to buy, to access cloud applications, to view, listen or check multimedia, to access training modules and a lot more. Modern computing requirements are demanding a capable network computer that can access all the information required in our modern knowledge economy. Google Chrome is my current selection, not only because is light, quick and efficient, but also because facilitates my day-to-day internet transactions in a transparent way and has a lot of extensions that ease various tasks and streamline your business workflow. Organize Chrome Bookmarks Like Professionals Do It! As you know, today there are a lot of extensions available, which can enhance Chrome in many ways and according to special requirements you might have by your web browser, but one valuable, feature, often overlooked, is the (common today) internal functionality of a web browser in storing bookmarks for later references. This process usually refers as bookmarking and is a common feature in all the modern browsers. Usually, in day-to-day browsing, we bookmark something we are interested in, for some later time, and if we are a little-organized person, we try to use categories for every bookmark we made. This is a typical operation, but, usually, is not an efficient one, since, after a while, we have piled up so many bookmarks (most of the times unorganized and without a clue on what they are referred to) that become useless in retrieving any information we require. You can use your web browser more productively, and effectively! Most of the time it is enough for you to see how you bookmark a site, page, etc, record the procedure you use (i.e. not the specific steps of bookmarking, CTRL+D for instance, but where you store the particular bookmark, whether or not you have an organization scheme, how you going to retrieve it easily, do you need to rename the bookmark on something more useful, or not, etc) and tweak it in a way serves you best. Along these lines, what I have to suggest, is a better organization, that, I think, can help you in your everyday internet requirements. An organization that can support both action and reference items (as it is common in the best time management methodologies) as well and certain elements of business intelligence in accessing quickly and easily the required resources. The proposed scheme is very easily applicable to any user with limited computer knowledge, and if properly constructed, can provide an integrated solution and a reference internet system for the laymen as well as the professional in the computer area. Back up all your bookmarks either locally (in your PC, Mac. Laptop, etc.) or in a network by using services like Google Bookmarks, Kippt, delicious, or any other bookmarking services. (ATTENTION: This step is very important! Do not proceed to step 2 before you have completed this step). 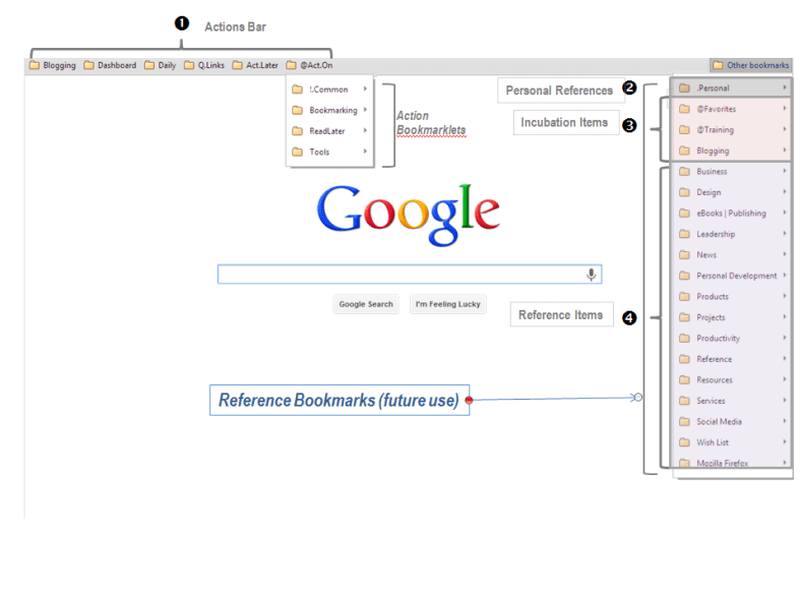 Organize the bookmarks you use into two separate categories according to their usability. Namely action items and reference items. Implement the action items category (#1 in the picture) in the bookmarks bar of Chrome (or any other browser) and the reference categories (#2, #3 & #4 in the picture) in the normal bookmark places (according to the browser you use). , Goodreads, Instapaper, etc.) Act.Later category (includes links related to things or tasks I want to study or proceed further such as software and tools I’d like to see, services to check out further, etc.) and finally the @Act.On category (includes mainly bookmarklets, performing various tasks, such as quick bookmarking (!!!) in different services I use, read later tasks, etc. The @ sign denotes action, such as in GTD methodology). Of course, every main action category includes sub-categories, according to my needs. For instance, the dashboard category includes sub-categories for the administration of my blogs and my sites, the collaboration tools I use, etc. In reference Items, go all the rest bookmarks and links that can be used or exploited in a further time. These links are best to be organized in categories that have a functional meaning for you (you can see mine categories in the picture). Categorize each and every bookmark in their respective category and use it according to the tasks you have to perform with each bookmark you store (i.e. review a paper, an article, a post, Read news, etc.). Review and amend accordingly the bookmarks you have already stored or are in temp folders, change their position according to their utilization or delete them when the tasks related to them have completed. The workflow, after you implement a scheme like the suggested one, is easy enough. You are on a web page, for instance, describing a new product, tool, services, information, you would like to learn further, but you don’t have the time to take a look right now. Simple, you can use read it later tools such as Instapaper or pocket utilizing the appropriate bookmarklets for such a task in your @Act.On category (or the similar one), or, if you don’t want to overload you later reading task list, you can use the Act.Later category (sub-category Services for instance !!!) to store it the link for further usage. To reduce the information overload by using temp locations for information to be processed at a later time without piling up information in large and already saturated Read Later lists. To provide a secondary mechanism for not lose important information. To provide a constant bookmarks scheme easily portable across different bookmarking services and browsers in different computing platforms. This scheme, in order to have a larger range of application, needs some more supportive tools such as a synchronization extension for sync all the bookmarks across different browsers and platforms (I used to use the Xmarks but now discontinued. For alternatives read here), and perhaps an extension for remove duplicate bookmarks (like SuperSorter). Furthermore, you can enhance the functionality of your bookmark with tools such as Holmes, Neater Bookmarks or Quickmarks, as these tools presented by Saikat Basu in his article: “Use these 3 Chrome Extensions To Speed Search Your Bookmarks With A Keystroke” or find some more, more suitable for your needs. Question: Do you think, you can use a system like that? Can you find it useful in your everyday activities? You can leave a comment by clicking here.